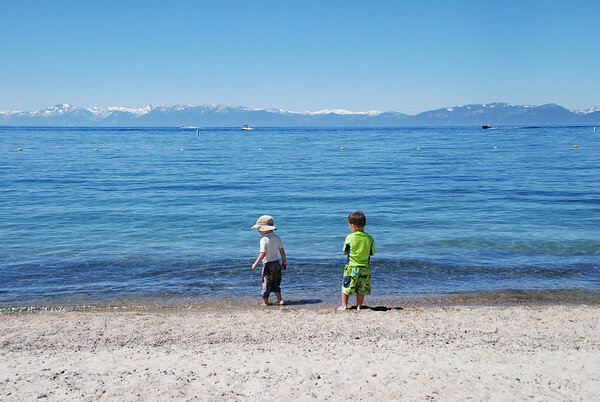 Last Saturday I kidnapped my family and whisked them away to Truckee and Tahoe City for the day. It was windy and chilly… and dead. It’s kind of weird up there this time of year because it’s in between the busy skiing and summer vacation seasons. No one was up there. This entry was posted in Blog and tagged trips, troy, us on April 25, 2008 by Jon Sagara. I don't know why, but I just had to post this. This was definitely not on my list of Things To Do Before I Die, but I'm glad I got to do it. It's not every day that you get to feed your son in an old prison recreation yard. This entry was posted in Blog and tagged fatherhood, trips, troy on March 21, 2008 by Jon Sagara. When we found out that I'd have a free week of vacation, Kelly and I decided very quickly that we should take advantage of it as best we could, so we booked a room near Fisherman's Wharf. She'd never been to Alcatraz, so we made visiting The Rock our main purpose. It is a trip. They have a guided audio tour, and they did such a good job with the tracks that, at times, it really sounds like you're standing in the middle of an operational prison. 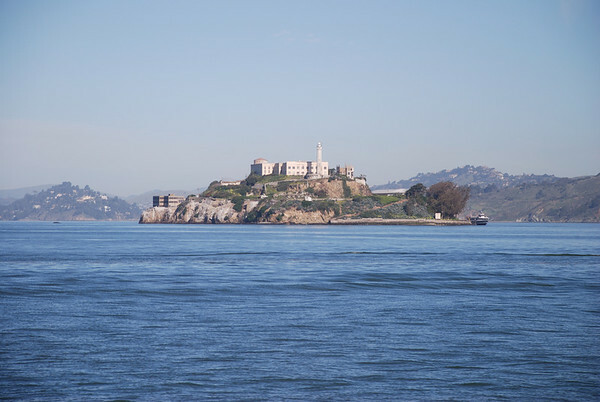 It's kind of neat to let your imagination run wild, picturing what it must have been like to arrive at Alcatraz, knowing that you'd be spending an interminable amount of time in the depths of hell. I have to tell you, I would NOT want to spend one second there as a prisoner. The hopelessness, the despair, the desolation… and I was just a tourist! 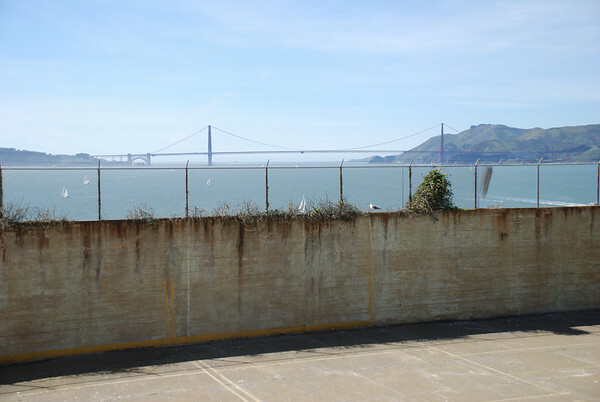 I bet many a prisoner sat on the recreation yard steps, peering at the Golden Gate Bridge, absolutely kicking himself for getting stuck in such a horrible predicament. Then again, probably not, because those guys were all major league assholes. We took a bunch of pictures, so if you have a spare moment, please go check them out on Flickr. This entry was posted in Blog and tagged trips on March 12, 2008 by Jon Sagara. 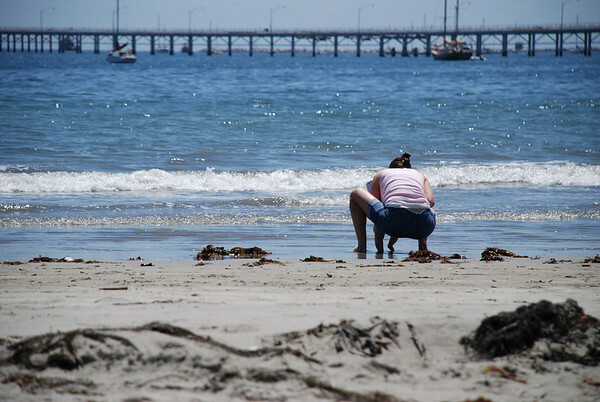 Continuing with our beach-themed vacation, yesterday we visited Avila Beach. If you step back for a second and look at some recent history, the Avila Beach of now is a far cry from the Avila Beach of when I was in college. Back in 1999, Unocal cleaned up some 400,000 gallons of oil by-products from underneath Avila, meaning that they dug up the entire beach and tore down pretty much all of the buildings along the beach front. It was not, by any stretch of the imagination, a beach resort vacation destination. We didn't spend much time there, but the weather was perfect, and the T-man got to stick his toes into the chilly Pacific once again. For lunch, we met up with some of my former VERITAS coworkers at the Cool Cat Cafe. Cool Cat is a burger joint straight out of the 50s, complete with greasy fries and real milkshakes. And let me tell you, if you're not used to eating that kind of food, you're not going to be feeling right for a couple of hours afterward. I believe the medical term for it is Food Coma. Dinner was magnificent. Kelly brought home some takeout from our favoritist Italian joint in the whole wide world, Buona Tavola. I had the Tagliolini, and she had the Tortellini di zucca alla salvia e mascarpone (pumpkin tortellini). Both. To. Die. For. If you're ever in SLO (or Paso Robles), PLEASE eat at this restaurant. You will not be disappointed. Not much happened, otherwise. It was a pretty low key and kick-back day. This entry was posted in Blog and tagged trips, us on August 7, 2007 by Jon Sagara. Yeah. We're pathetic. We had lunch from Cugini's for the second day in a row. The pizza is sooooo gooooood! We just couldn't help ourselves. Anyway, we didn't do a whole lot yesterday. 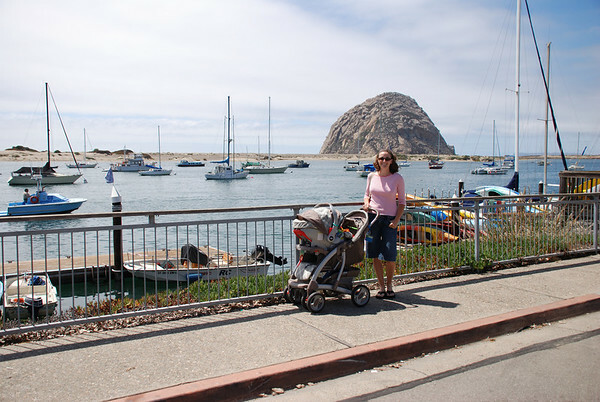 We went for a walk in the morning, and, after lunch, we headed up to Morro Bay to walk around on Embarcadero St. We had a nice relaxing afternoon up there. The weather was perfect, and, by chance, the local merchants were having a street fair, so we got to check out an eclectic mix of wares being hawked. One guy was even selling backyard drilling contracts with his plates of BBQ Tri-Tip. That confused the hell out of me until I took my finger out of my eye socket and realized that his business was in fact backyard grilling. I are smart, Cletus. For dinner, I had a Red Dragon Roll from Yanagi Sushi. That's absolutely one of my favorite rolls of all time, though I wouldn't go so far as to call it #1. In fact, I don't know if I could designate any roll as the top dog. There are just too many good ones out there to choose from. Like I said, it was a pretty mellow day. You tend not to do too many Wild-N-Crazy Things when you have an infant in tow. Not that I'm complaining. This downtime is just what the doctor ordered. It's nice to get away from it all. This entry was posted in Blog and tagged good-eats, trips, troy, us on August 6, 2007 by Jon Sagara. Jeez, you leave for 2 years, and everything goes to hell. Not that there's anything wrong with country music, but when you're bombing down the Cuesta Grade at 11:30pm, and there's nothing on the XM radio, and you've listened to the CD in the deck about 47 times since you started driving, the next natural step is to turn on the good ol' terrestrial FM radio and tune into the stations that you know will play some good Top 40 tunes. Instead, I got an earful of manure. 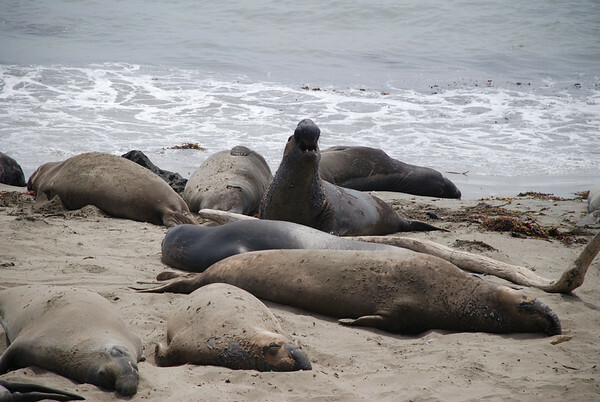 Sakura is no more – it's now called "Sushiya"
One thing that is still the same is the presence of elephant seals up north of San Simeon. As you can see from the picture above, they are quite fat and lazy. Get a job, ya bums! Also, the weather is just about perfect compared to the cesspool that is the Sacramento Valley. Glad to see that hasn't changed. We're having fun driving around, reminiscing about all the good times down here. It's hard to believe it has been over 10 years since I first came down here to go to school. This city is just so awesome. We're also trying to hit all of our favorite restaurants while we're here. Yesterday, we hit up Cugini's (for me), Nucci's (for Kelly), and Mandarin Gourmet for dinner. That's always the dangerous part of coming back to SLO. There's just too much good food here. As for Troy, how's he handling all of this, with the moderate climate and the fresh air and the beautiful sights? Let's just say that he "exploded" with enthusiasm, "unloading" his glee at being in new surroundings. 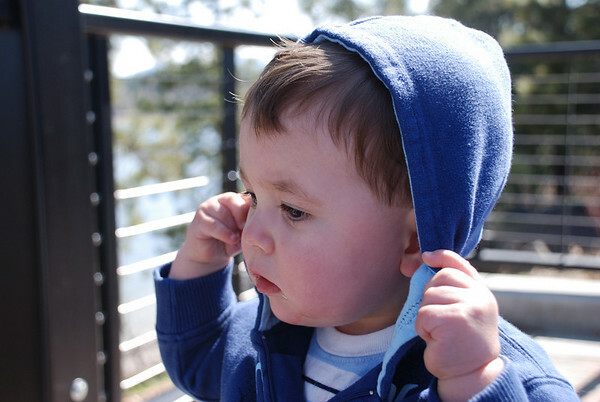 He is "relieved" at the prospect of finally seeing where Mommy and Daddy went to college. 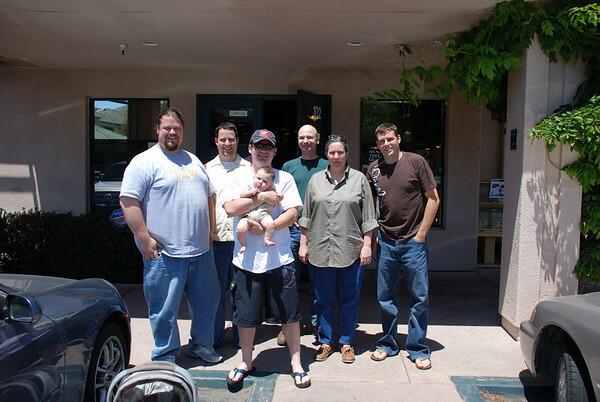 This entry was posted in Blog and tagged good-eats, trips, troy, us on August 5, 2007 by Jon Sagara.